It's raining today, as it has done many days out of the last few weeks. I personally am slightly ambivalent on the rain. Truly the farm looks better than it ever has. Everything is flourishing and looking beautiful, and I have to be grateful for that. Yet the rain truly reveals the uncertain life of a farmer- a day one mentally prepared to spend doing some good hard work in the sun could end up being spent sequestered indoors, unshowered and half dressed, watching movies (and writing blog entries) while the rain pours outside. Today started as one of these days, with good hard work in the sweltering sauna-like heat and sun. 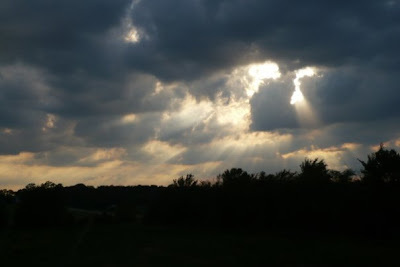 Yet by 1:30, the hysteria of the television weathermen finally proved to be true and the ominous clouds on the horizon blew in seemingly instantly with the temperature dropping in a matter of minutes and the wind picking up. The foretold hail and tornadoes did not materialize, at least not near St. Peter, but a steady wall of rain took hold and is expected to contiune sporadically throughout the day. Personally I have a deadly fear of hail and what it might do to our farm. Cross your fingers. The potatoes, formerly resigned to "dead" status by our premature doomsday predictions, are some of the biggest and prettiest plants around. The humidity has been good to the corn as well, and we are well on track to be "knee high" by the fourth of July. 175 marigolds have been added around the perimeter of the fence to repel rascally rabbits and attract helpful insects. Our pest problem seems to be curbed by our noxious cayenne pepper concoction. Another mark against the rain- it helps our plants but also helps the weeds. Being in the middle of a wide field, and not using pesticides, we have the problem of all sorts of pesky plants blowing through. The past week has seen a huge influx of tiny weeds all over and parts of the garden look like a front lawn. A lesson that we should have mulched sooner, perhaps? Weeding it seems like the most futile task, it feels like weeding the grass from a golf course. But as long as its not raining, we've got nothing but time, so I guess we will hit the Big Hill links hard in the next days. And also here are a few pictures of the farm from last week, expect more soon. The first week of official summer on the farm has been full of progress and beautiful new growth. Everything is planted (including eggplant) and almost everything has begun to poke out of the soil surface. 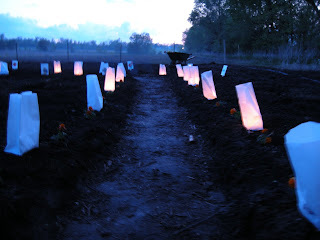 The tomato transplants look like heaven, especially since we added drip-line. Now it only takes an hour to water the farm (wink). 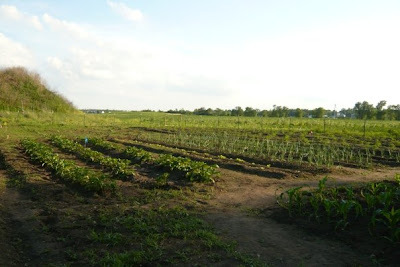 The pepper transplants had a run-in with some pesky cutworms... however, the worms don't seem to like the stanky onion-garlic-cayenne pepper-dish soap potion we sprayed on the plants, so we have averted disaster, thanks to book Barbara. The fence is up, the shed is fixed, the mural is painted, the compost is spread, and the farm CD mixes are complete. All we need now is a 15 pound bag of trail mix and we're good to go. A huge thank-you is in order to everyone who came out for the Big Hill Farm Inauguration. None of us are math majors, but we'd estimate over 100 people - students, staff, family, friends, alumns and community members - were able to attend. We hope everyone enjoyed the live music, Cedar Summit ice cream, the farm and the company! We think this event was a HUGE success and cannot wait until the Harvest Festival this fall. There was also a short rain shower in the middle followed by a rainbow - a blessing perhaps? Above: Oh hey Jordan! The rain during the Inauguration altered our creative process for the Big Hill sign-painting (on the shed) - but no hard feelings. Above: We've been busy these last couple weeks! Thus far we have worked on the fence and planted strawberries, radishes, onions, potatoes, raspberries, blueberries and corn. Above: Here's me! (Eliza) working on the onion beds. Finally some beautiful weather after a freezing weekend and a 97 degree 500 mph windy spell of days. 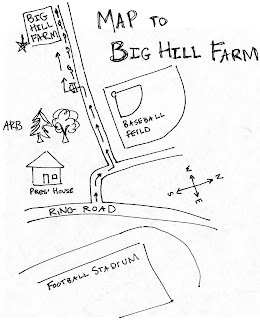 Big Hill Farm Inauguration this Saturday! Hello! YOU are invited to Big Hill Farm's Inauguration, Sat., May 9th, 7 p.m. to 9 p.m. Come for FREE cedar summit ice cream, music, art, and an abundance of overalls! The seeds are germinating!! The tray of roma's has almost completely germinated and they look strong and healthy. The peppers are close behind as they just started germinating a couple days ago and look wonderful! We have been watering them religiously and keepin' a close eye. We officially have farm interns: Lucas Neher, Jordan Walker, Steve Palmer, Sarah Jabar. Yayyy. We took a trip to Menards yesterday and had our first tool buying adventure. We bought shovels, rakes, pitchforks, hand trowels, fencing material, etc. and we assembled a wheelbarrow! And thennnn we used the newly purchased tools to move the compost and put chicken wire around it. We layered it with straw and when the rain falls, wonderful decomposition will happen. The bottom layer of the food scrap pile was already decomposing and leaching wonderful nutrients into the soil! We are very excited about the compost progress. & we want to Thank the dining services for all the food scraps they have been giving to us!!! Also, there is now a beautiful layer of compost and giant shed on the plot!! Thanks to the Gustavus Physical Plant! We officially know who our farmers are this summer! But I'm not going to tell you yet. ;) Soon. Very soon we will be tillin' up da dirt, which will include a ground breaking ceremony!